The purchase of a child's plate necessitated a bit of sleuthing. I had never heard of the Thames Tunnel. 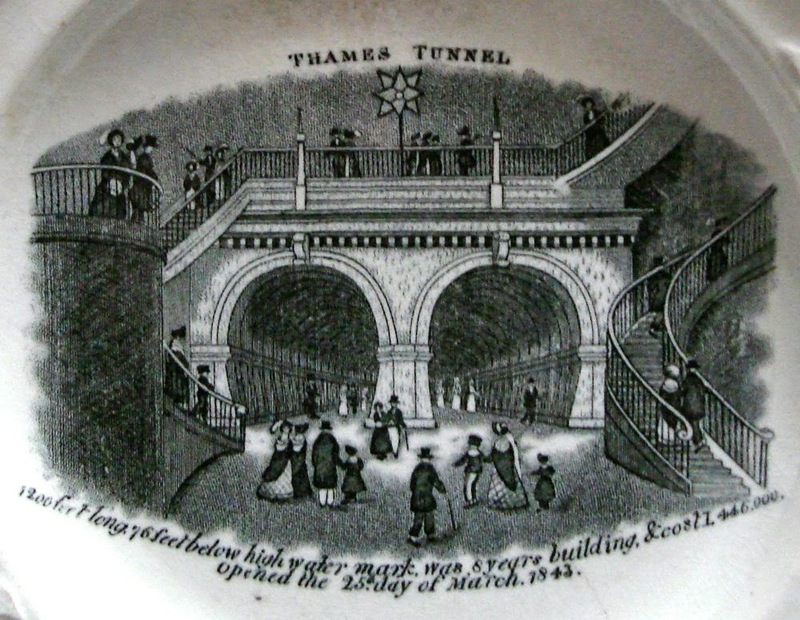 The Thames Tunnel was the first underwater tunnel. It was built beneath the Thames in London. The text on the plate says it was: 1200 feet long. 76 feet below high water mark, was 8 years building, & cost 446, 000 pounds. Opened the 25th day of March. 1843. 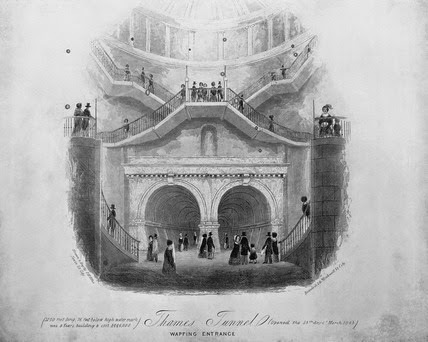 An interesting history of the Thames Tunnel is found here. What was undertaken as a more efficient way to move goods and people across the Thames never came to fruition. Instead, the tunnel was billed as the Eighth Wonder of the World! People flocked to experience the walk under the water! Souvenirs, of which the plate above is one, sold well. However, the tunnel was a financial disaster. A railway company purchased the tunnel in 1865, and today the tunnel is part of the London Overground. The plate is impressed Scott for Scott & Co. (1800-1897). The distinctive Rose, Tulip and Aster molded border was used by the factory for many of the children's patterns and commemorative patterns that they made. Two large cracks didn't deter me from buying such an interesting piece of history. For a bit more history, read about two famous engineers who designed and worked on the tunnel: Marc Isambard Brunel his son Isambard Kingdom Brunel. It is a treasure. I love the history I learn from studying transferware. 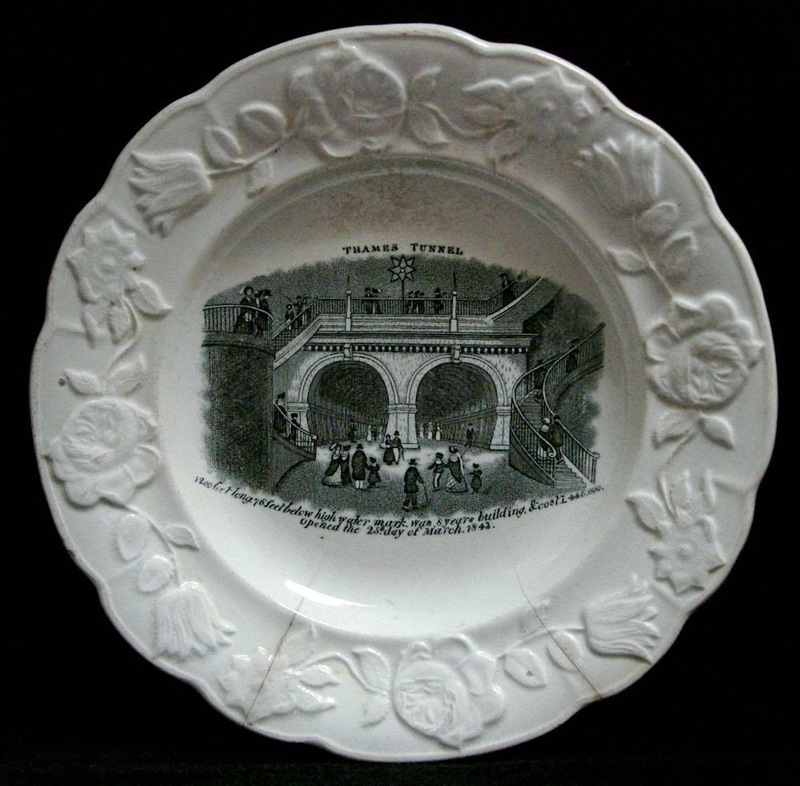 Another plate I've never seen, though we do sometimes find other non-pottery commemoratives for this tunnel. Thank you for showing us! I hope to visit the tunnel the next time I am in London. I believe that it's only possible to travel through the tunnel on a train and I don't think that you would be able see much anyway. If you are interested, I'd suggest contacting London Transport for definite information. Thanks Phil. I shall do that. I would much rather walk through the tunnel than ride through it! Hello Julie - I'm thrilled to tell you I found a beautiful horn beaker today, engraved with this scene on one side and a sailing ship on the other! No plate yet, I'm afraid.